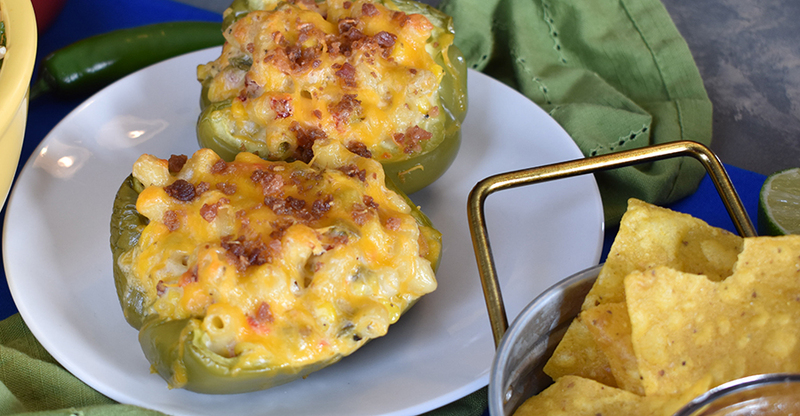 Five ingredients transforms our Gourmet Macaroni & Cheese into a dish that everyone will love! Heat Mrs. Gerry’s Gourmet Macaroni & Cheese according to package directions. Carefully pour into large mixing bowl. Gently stir in ingredients, except tortilla chips. Pour into greased half pan; top with crushed tortilla chips. Bake for 15 to 20 minutes or until mixture is hot and tortilla chips are lightly browned. Serve immediately or maintain at 165° to 180°F. Makes 12 to 14 servings. Southwestern Dip and Cowboy Caviar in one recipe?! You won’t be able to stop until it’s all gone. Combine all ingredients in medium saucepan. Heat to 165° to 180°F, stirring often to prevent sticking. Dip may be kept warm in a Crockpot on low setting. Serve with tortilla chips. 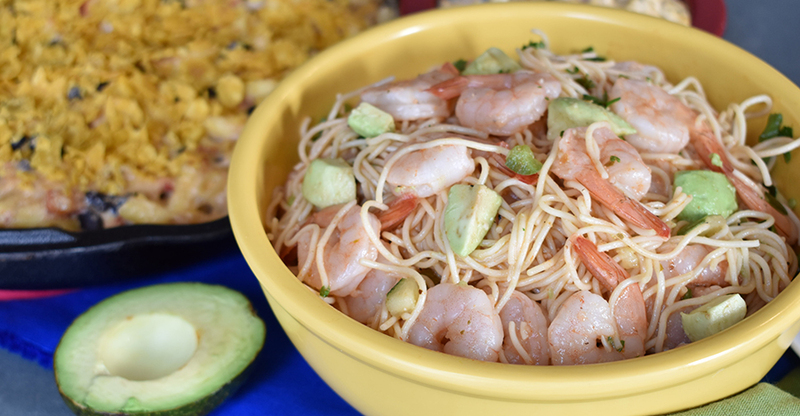 The angel hair pasta and red wine vinegar dressing from our Spaghettini Salad paired with shrimp, lime juice, cilantro and fresh avocado makes for a great side salad during Lent or any time of the year. In a large bowl, combine all ingredients except avocado. Chill to 33° to 39°F. Just before serving, dice the avocado and add to salad. Serve chilled. Kick your potato salad up a notch! 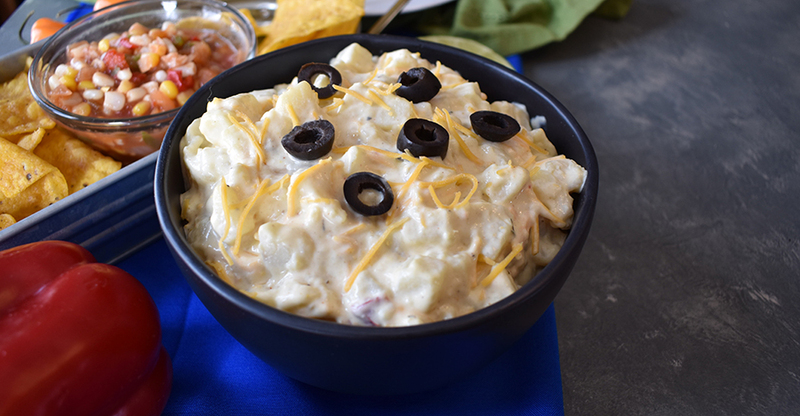 Add our Southwestern Dip and Cheddar cheese to our already delicious Deli Fresh or Original Potato Salads. Keep refrigerated at 33° to 39°F until serving. Place the sliced rye bread on the countertop; spread about 1 tablespoon of Russian dressing over each slice. Top one of the slices of bread with the corned beef or turkey and Swiss cheese. Drain the Sweet Pepper Slaw removing any excess moisture. 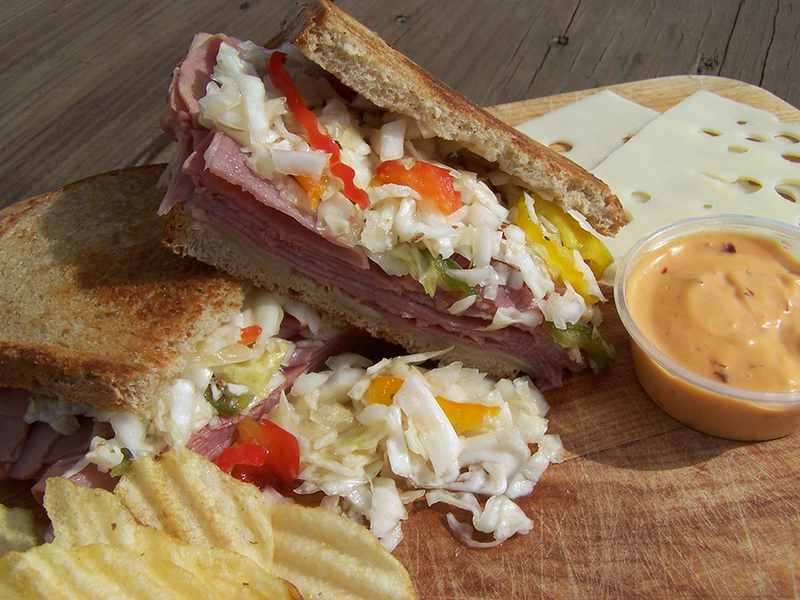 Pile the Sweet Pepper Slaw on the cheese layer and then top with the other slice of bread (Russian dressing side down). Spread the softened butter over the top and bottom of the sandwich. Place a heavy skillet or griddle over medium-low heat. Add the sandwich and cook until the bottom is golden brown. Carefully turn it over and cook until the other side has browned and the cheese has melted and sandwich is heated to 165°F. Serve immediately or maintain 165° to 180°F. 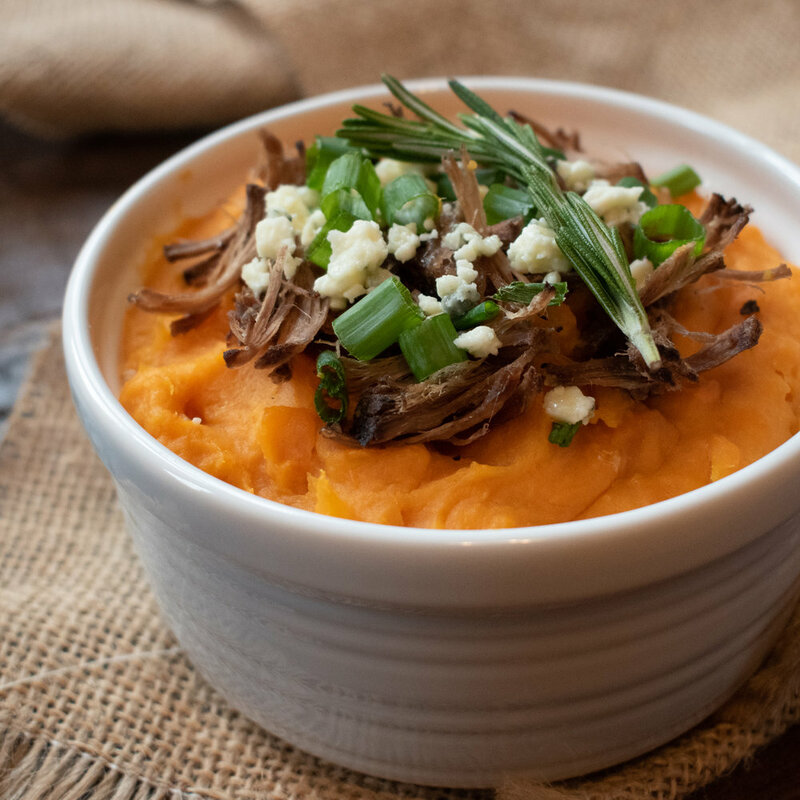 Heat Mrs. Gerry’s Mashed Sweet Potatoes to 165° to 180°F. Top with streusel and lightly toast in oven. If desired, top with a sprinkle of cinnamon and/or mix in mini marshmallows. Cook Asian vegetable mix according to package directions. 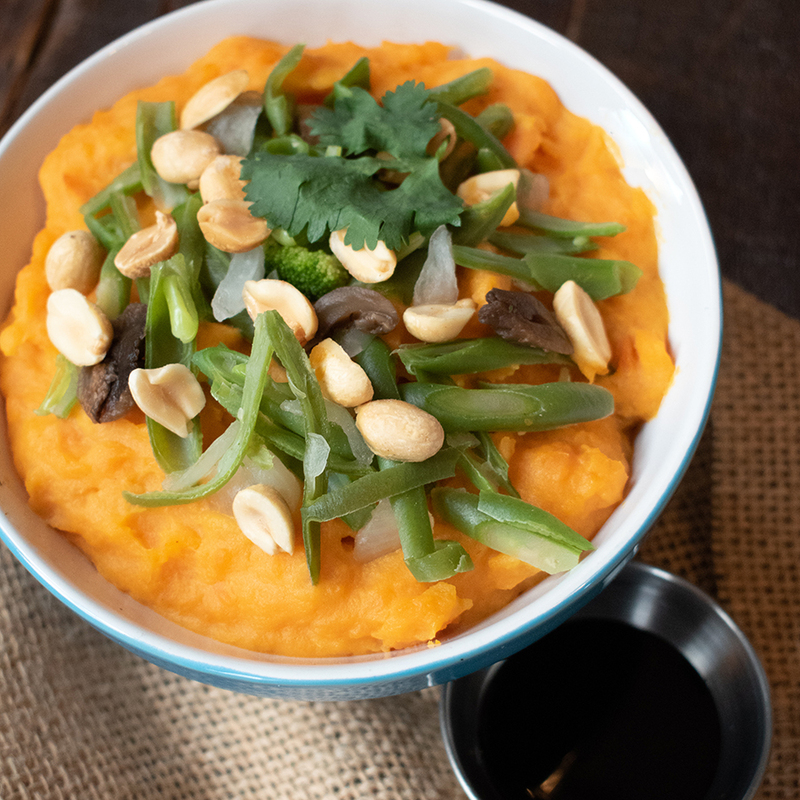 Top Sweet Mashed Potatoes with vegetables. Garnish wish peanuts and cilantro. Drizzle with soy sauce immediately before serving. Top with desired amount of roast beef, blue cheese crumbles, and scallions. Our Sombrero Pasta is a sweet and spicy Mexican-inspired salad. Add in ground beef and extra cheese, and you have a hearty entree everyone will love. Make it extra special by topping it off with sour cream, salsa and crushed corn chips. Brown ground beef with salt; drain off grease. Combine all ingredients in a large saucepan, and heat over medium low heat to 165° to 180°F, stirring often to prevent sticking. Preheat oven to 375°F. Spoon hot mixture into lightly greased 4-inch deep half pan. Spread with Cheddar Jack cheese. Bake at 375°F for 15-20 minutes or until cheese is melted. Serve immediately with sour cream, salsa and crushed corn chips, sprinkled on top. Freshly grilled chicken wrapped in a fresh vegetable and cabbage mixture that has been tossed in our sweet oriental-flavored dressing. Ramen noodles an an extra crunch! 3 lbs. pre-packaged salad mix that includes shredded cabbage, carrots, green onions, celery, etc. Combine Oriental Crunch dressing, ramen/nut mixture and prepackaged salad mix. Arrange lettuce leaves and snow pea pods on each wrap. Layer with 1 cup Mrs. Gerry’s Oriental Crunch Salad and top with chicken breast strips. Keep chilled at 33° to 39°F until served. Place peanut butter in microwavable bowl; cover. Gently heat until it is slightly warm and pourable. Stir peanut butter into Thai Couscous Salad. Add the cooked chicken and stir to combine. Scoop ½ cup of mixture into each lettuce leaf. Garnish with chopped peanuts. Keep chilled at 33° to 39°F until served. *For a vegetarian option, omit chicken. 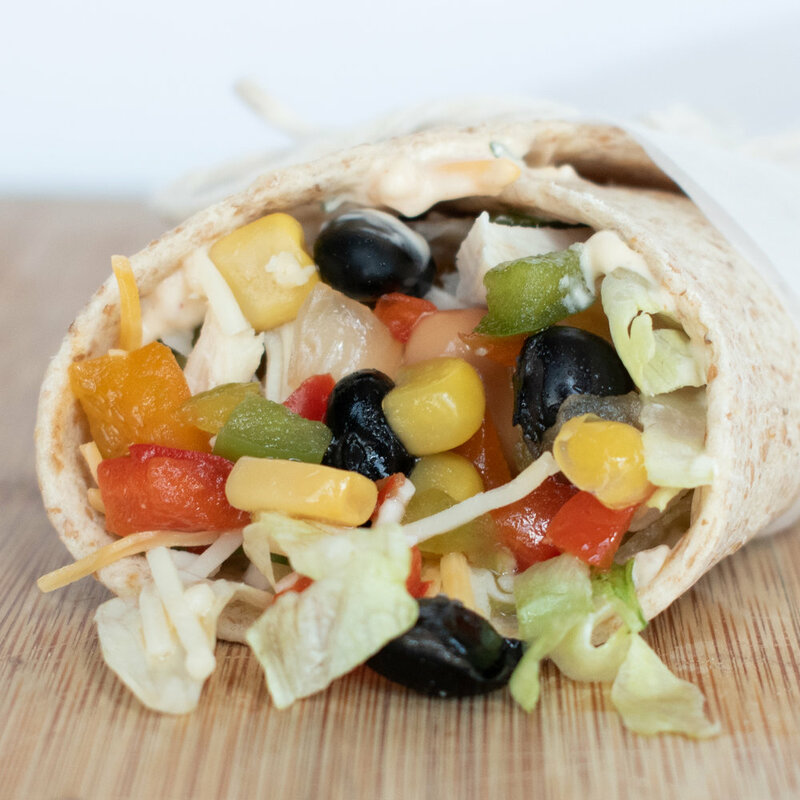 Two of our most popular products wrapped up in a tortilla with chicken, lettuce and cheddar cheese. Spread Southwestern Dip evenly on wrap to within ½ inch of edge. Top with drained Cowboy Caviar, chicken strips, lettuce and cheese. If you're looking for the ultimate comfort food, look no further! Tender pork on top of a piece of whole wheat bread, with a generous scoop of our Hot Premium Mashed Potatoes. Ladle on the gravy and enjoy! Heat pork, mashed potatoes and gravy to 165° to 180°F. Top bread with pork and mashed potatoes. Our Cheese Tortellini Kit and your Alfredo sauce makes one easy, cheesy meal! In a medium saucepan, combine salad and Alfredo sauce. Heat until mixture reaches 165° to 180°F, stirring frequently.